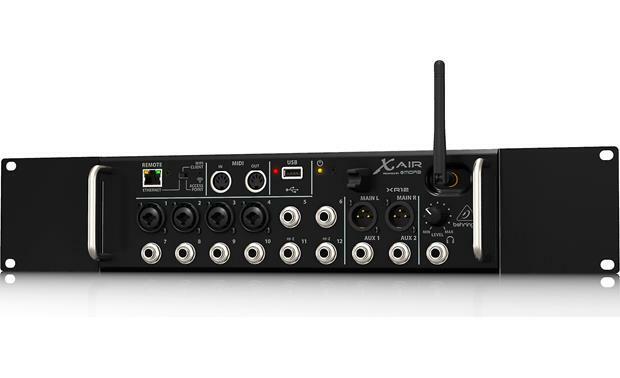 Behringer's X Air XR12 12-channel digital mixer lets you control your show from virtually anywhere in the venue with your Wi-Fi-enabled tablet or phone. The rack-mountable XR12 is designed to sit onstage wired to the musicians and speakers while you control the show wirelessly from your personal device. After downloading the app, you connect to the XR12 via its built-in wireless router, and mix away using your touchscreen as the control surface. The XR12 features four Midas-designed microphone preamps that give every vocal a high-fidelity start to its journey to a good mix. Combination XLR/TRS jacks allow you to use these inputs for line-level instruments as well as mics. Eight 1/4" TRS line inputs stand ready for more instruments. You can plug guitars directly into channels 11 and 12, which can handle the high-impedance signals and send them to guitar amp simulators in the XR12's software, saving guitarists from having to lug their amps around to every gig. In addition to the main left/right outputs the XR12 includes two auxiliary outputs so you can create two different monitor mixes to keep the band happy. You can record and play back stereo WAV files via a USB connection. 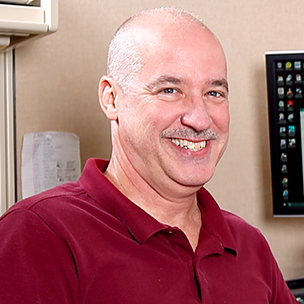 You can hard-wire your computer to an XR12 via its Ethernet port and Cat5e cable for a more robust control connection. You'll even find MIDI connections for instrumental control. When the mix is perfect, you can save your settings as a scene that you can recall for a later show, saving valuable set up time. You also have the ability to save a preset, a subset of the mixer's overall settings, like the vocal EQ and compression or the mix of a drum kit. 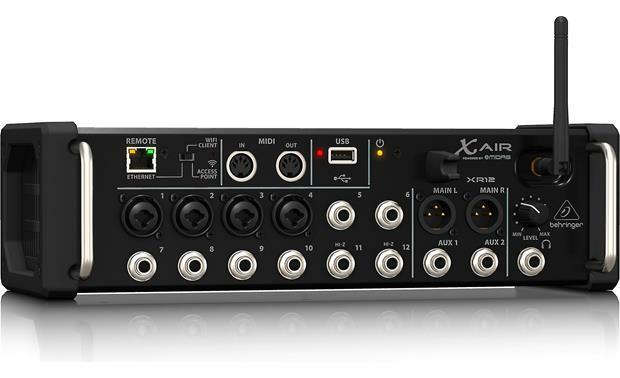 The first eight channels of the XR12 can get assigned to Auto-Mix, which automatically lowers the levels of some of the mics when a prioritized mic is active, clearing up the sound in multi-mic panel discussions for instance. You can fill each of the four stereo effects slots with one of at least forty different effects, like graphic equalizers, compressors, including a multi-band version, different reverbs, delays, a pitch bender, even guitar amp simulations. 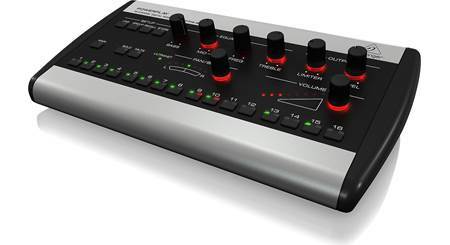 Behringer modeled each plug-in to emulate or sound like a modern or classic piece of hardware. A 100-band RTA displays the sound spectrum so you can see any hot spots and dips that need equalization. 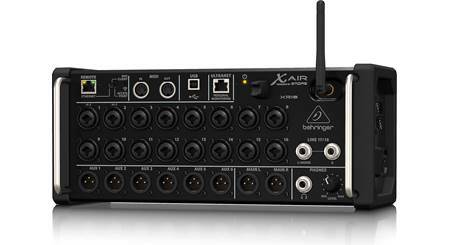 Overview: The Behringer X Air XR12 is a 12-channel digital mixer that can be controlled by an iPad or Android tablet or PC. 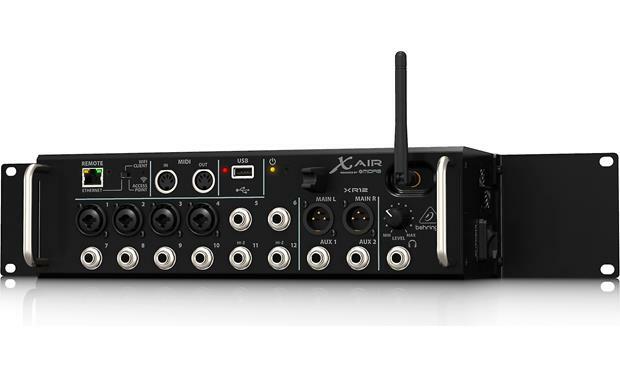 The mixer is equipped with 12 input channels (with 4 XLR/TRS combo jacks and eight 1/4" TRS balanced line/Aux inputs), with 4 FX return channels, 6 Aux buses, and Main L/R outputs. The XR12 comes with rubber protection bumpers on the outer edges, plus rack ears for installing the mixer in an equipment rack. MIDAS Mic Preamps: The XR12 has 4 high-quality MIDAS-designed microphone preamps. MIDAS preamps are considered by industry experts as the industry's best sounding designs. 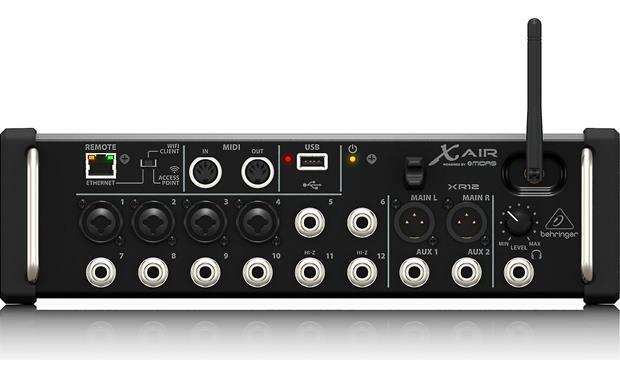 The preamps found in the X Air series digital mixers provide high-quality audio reproduction in both live and studio applications. Each mic preamp can be setup and adjusted along many parameters, such as gain, phase, and phantom power. You can also insert effects, apply compression, engage low cut filters to remove unwanted low frequencies, and link adjacent channels together for stereo operation. 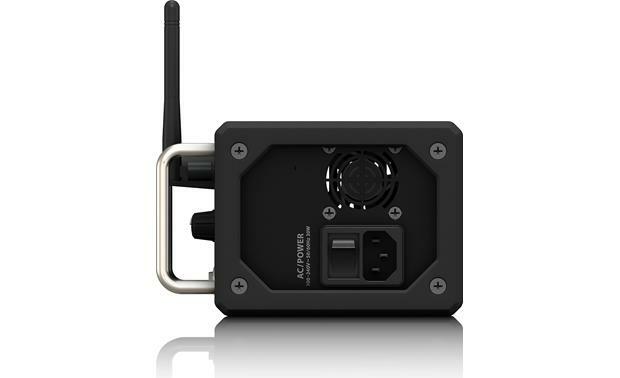 Built-in Wi-Fi: The XR12 features a Tri-Mode Wi-Fi router that lets you control your mixer's functions wirelessly from your iPad or Android tablet, or PC. This allows you to move about the venue to hear what the audience is hearing, or set up stage monitors from the performer's perspective. You can even allow the performers to adjust their own monitors (in-ear or floor) from the stage via their own tablet. 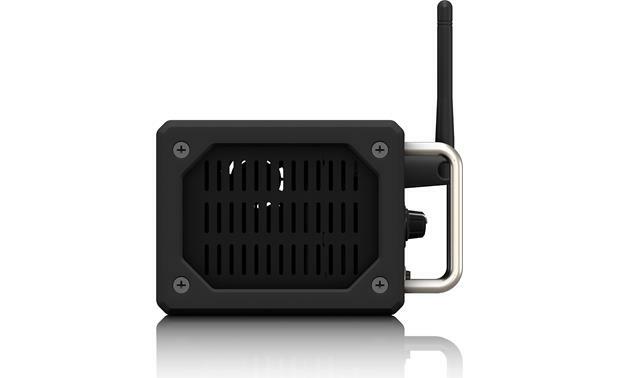 You can also set up wired connections directly to your PC, to a local area network (LAN), or to a dedicated Wi-Fi router for extended range or 5 GHz applications. 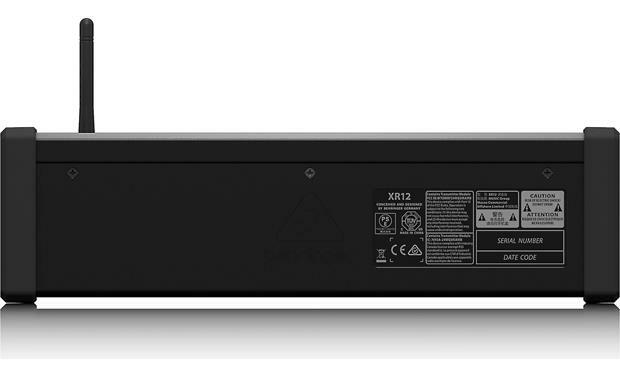 A three-way switch (Ethernet - Wi-Fi Client - Access Point) lets you configure the XR12 to suit your needs. 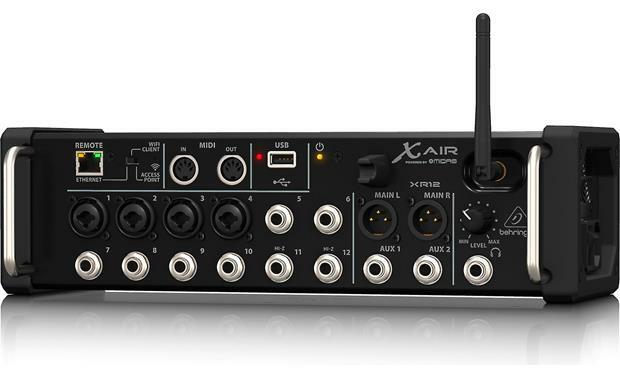 A/D-D/A Conversion: The XR12 uses Cirrus Logic A/D (analog-to-digital) and D/A (digital-to-analog) converters. The converters are 24-bit @ 44.1 or 48kHz with 114dB dynamic range. USB Port: The XR12's Type A USB port accepts a flash drive for file storage, stereo recordings, and playback. Effects: The XR12 is equipped with 4 studio-quality stereo (or 8 mono) multi-effects processors, including delay, chorus, and dynamics. These are the same effects processors found in the award-winning X32 mixing console. In addition, 31-band EQs are available on the main and aux buses. The processing is performed onboard, instead of your computer or tablet. 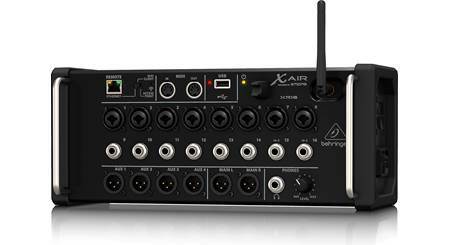 Inputs: The X Air XR12 features 4 programmable mic preamps, each with XLR/TRS balanced combo jacks. In addition, there are eight 1/4" TRS Line inputs. Two of the TRS inputs (channels 11-12) can be designated as balanced or unbalanced Hi-Z inputs. 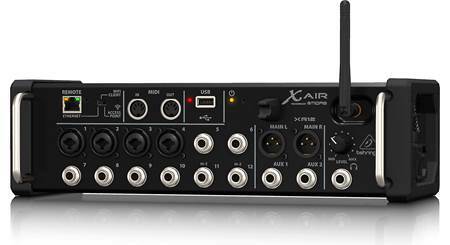 Main/Aux: The XR12 has two XLR balanced main outputs in mono or stereo. There are also 2 XLR balanced Aux outputs. 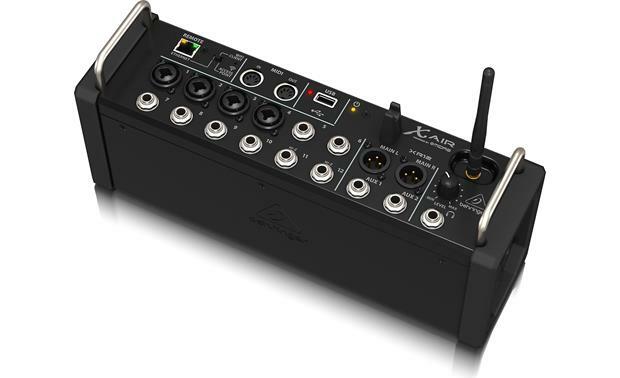 Dimensions: Width 13.1" Height 3.7" Depth 5.9"
Searches related to the Behringer X Air XR12 12-channel remote-controlled digital mixer with Wi-Fi®.